No matter how hard you try not to stare, the European furniture design at the furniture store definitely catches your eyes. It is so beautiful, catchy and luxurious that it becomes next to impossible to look away from what you have been looking for. This is the also the reason why a number of people only think about European designs when it comes to designing their own luxurious houses. The luxurious European design that we would be talking about below are inspired from Italian luxury homes and contains many warm shades of apricots, terracotta and even tan. This makes the house look perfect without doing much of an effort. Let us first start with the walls. Covered in a sand brown shade, the walls would definitely be providing you something great to look forward to. This helps in ensuring that you get what you have been looking for in luxury. 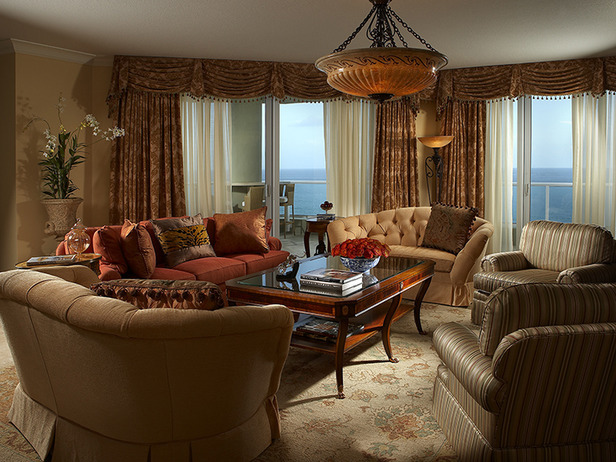 The sand brown color matches well with every color that we would be using in the furniture and furnishings of the room. Oyster grey windows should be matched with sheer white curtains. To complement them, bring some heavy apricot brown curtains that are lightly textures to complete the look. Never go for white lights in the room. Chose amber shades or any other warm shades that you may like but avoid white as much as possible. This light does help you get the best of the looks. You would be getting three different kinds of couches and sofas in the room. The centerpiece would be a terracotta couch that is firm but thickly padded as well. There would not be much of arm rests here, but you need to add some cushions here. The second kind of couches would be placed on either side of the terracotta couch and must be a shade of tan. This helps you achieve a better look. Go for textured boards and high armrests and use cushions here as well. This would help break the tan monotony of the room. Now, just go for two individual textured or patterned tan sofas that can be used to fill the space leftover in the living room. You are through with the seating of the room. Don’t forget the fact that you need a lot of cushions over here. However, don’t just ‘throw’ them over. The European style is very formal and you have to abide by those rules. In the center, add an arched leg table with a glass table top. Make sure you have a beautiful, floral printed tan or sand yellow colored rug to add to the brilliance of the room. You would need a table lamp to finish off the furniture and furnishings of the room. Make sure that everything is quite neat and you don’t have to make it look casual or outgoing. It’s an Italian style luxurious living room that is designed for serious conversations added with a touch of brilliance. Adding a Chinese bowl style flower vase on the table would be a great idea as well.